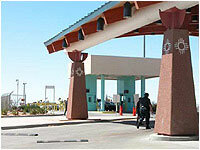 The Santa Teresa Port of Entry is located 42 miles south of New Mexico's second largest city, Las Cruces, and 20 minutes from historic downtown El Paso, Texas. From the POE, Interstate 10 is an easy 12 miles down the modern Pete Domenici Highway, the newest borderland multi-lane transportation link. With little congestion and short lines, Santa Teresa, via its sister port Jeronimo is the premier driving route to southern Cd. Juarez, Cd. Chihuahua, and further into the interior of Mexico. Mexican travelers increasingly discover this port provides convenient and rapid access to New Mexico and the western United States. Open daily for commercial, non-commercial, and pedestrian traffic, Santa Teresa is the newest port of entry on the US/Mexico border. The state-of-the art facilities were completed in 1997, replacing the original port, which opened in 1992. Providing unique services, Santa Teresa is the only port in the region that processes most types of exported used vehicles destined for resale in Mexico. Hundreds of thousands of cattle cross each year making the port host to the largest livestock import/export facility on the Mexican border. In addition, Customs and Border Protection officers from Santa Teresa process international aircraft operations at the nearby county airport and oversee the Doña Ana County Foreign Trade Zone at the Santa Teresa Industrial Park. Southbound travelers on I 10 take Exit 8, and proceed westward on Artcraft Road. Crossing the New Mexico state line, the road becomes the Pete Domenici Highway and continues on 12 miles to the Santa Teresa Port of Entry.